A n extract from the 2nd ”On The Cheap” magazine. I think Powercuts used to be “Yanks” which was el cheapo but most of the records had the corners cut off ,(something to do with them being imports I think). Mind you if I could have ever got Al Wilson’s “The Snake “, Etta James "Rather Go Blind" or Marlena Shaw's take on "Wade In The Water" on a K-tel or Pickwick compilation instead of on a 7” it wouldn’t have worried me too much;(Chrimbo coming though, I've been good this year so here's hoping....). Pandemonium was run by a big old hippy twot (called George I think...) and expensive to boot. 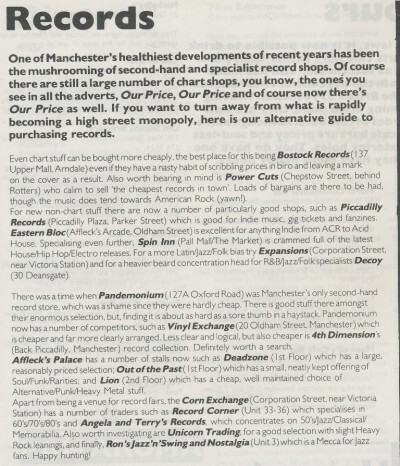 Doesn’t mention Discount records in the Underground, which may have been long gone by then, or Record Peddlar up on Ancoats St. Agreed - Powercuts used to Yanks - just down from Rotters with the iconic PERNOD logo. You went down some stairs past wierd machinery & conveyor belts to 2 rooms of US imports almost all with 'drilled' covers. It was definately worth a browse. ''Robinsons'' on Blackfriars St was pretty good as well, you could spend hours sifting in there. Cheers for another quality upload! !